​Within the past three years, the number of food trucks in Milwaukee has increased exponentially. For proof that this trend is on a roll, read on to hear about where to score grilled-cheese sandwiches, sushi, tacos, Cuban cuisine, crepes, waffles and Jamaican jerk. Want to do a taste-around? That’s easy, too. Just drop by Schlitz Park on Tuesdays for “Take-Out Tuesday” (11 a.m.-2 p.m.), the Westtown Farmers Market on Wednesdays (10 a.m.-3 p.m.), “Food Truck Thursday” at the Milwaukee County Courthouse (11 a.m.-2 p.m.) or Fridays at Red Arrow Park in downtown Milwaukee (10:30 a.m.-1:30 p.m.). Vegans and vegetarians can get their taco fix now thanks to Gypsy Taco’s unique signature items, such as a root-vegetable taco, while off-beat ingredients like fried squid and locally procured pork sausage keep meat- and fish-eaters happy. Enjoy your grub in the back yard at Boone & Crockett, where a special outdoor bar is only a few feet away from your table (nice!). Where to Find It: The truck is permanently parked behind Boone & Crockett in Bay View. Cuba is on everyone’s mind these days, and that includes the country’s cuisine. Little Havana Express Food Truck dishes up Cuban sandwiches, empanadas, specialty soups (like shrimp soup or plantation soup) and ropa vieja (shredded beef). It’s easy to spot Press Waffle: look for the vintage 1962 trailer painted white and sea-foam green. Belgian liege-style waffles are dusted with powdered sugar, topped with decadent ingredients (such as peaches, lemon curd and locally made quark cheese), and based on a recipe dating back to the 1700s in Belgium. In addition to the two below farmer’s markets, a daily calendar details other stops and is posted on the truck’s website. Where to Find It: The truck is always parked at South Shore Farmers Market in Bay View Saturday mornings and Shorewood Farmers Market on Sunday mornings. Born out of the Thiensville restaurant, the menu is all about Middle Eastern cuisine. Staples like falafel, schnitzel and shawarma are served out of this brightly colored (blue and yellow) truck. Watch the food truck’s Twitter feed for news of where you can find it at events and festivals, too. 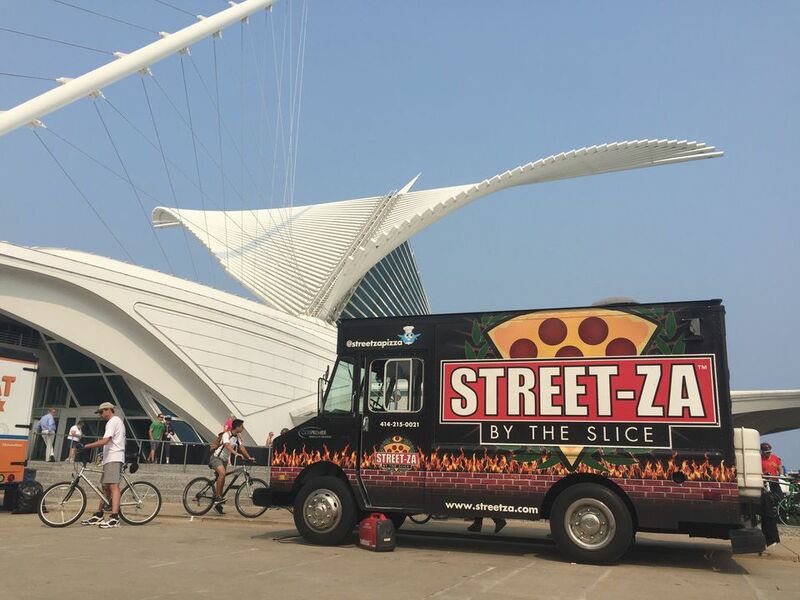 Where to Find It: Find the truck at “Take-Out Tuesday” at Schlitz Park Tuesday afternoons, Wednesday at Westtown Farmers Market and at the U.S. Bank building in downtown Milwaukee Fridays from 11 a.m.-2 p.m.
Cones are the new It food and this Milwaukee truck is no exception. All of The Rolling Cones’ menu items—including chicken, pork and vegetarian foods (such as the “Vegetarian Shepherd’s Pie”)—are served inside baked bread cones. Signature cones include “Ham & Bacon Mac & Cheese” and “Hunan Beef” (marinated beef strips with red bell peppers, brown rice and scallions, and topped with sweet-and-spicy sauce). All are very rich in flavor and can serve as a meal. Where to Find It: Check the truck's site for an events schedule. Naturally, a Wisconsin food truck is going to be oozing with cheesy menu items. Gouda Girls’ (Tina and Katherine) serves mac n’ cheese, Wisconsin cheesesteak, grilled-cheese sandwiches and cheesecake. The perfect sides can be ordered, too, like tomato soup and a salad of organic spring-greens. Where to Find It: Check the truck’s Facebook feed. Every single treat served from this renovated trailer is inspired by New Zealand “breaky” (Kiwi-speak for breakfast) or lunch items. A trio of combos feature savory pies, a choice of sausage roll or a biscuit, and a fizzy drink or coffee. Three puddings make sure you end the meal on a sweet note: cheesecake, tiramisu and brown-sugar. There are seven pie options, including curry vegetable, and mince and cheese. Where to Find It: The truck is permanently parked at 330 N. Broadway, in Milwaukee’s Third Ward.